Cyst of Magallanesium macmurdoense, from here. 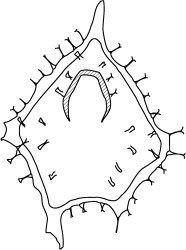 The Peridiniaceae are a group of dinoflagellates with a distinct cingulum, containing four to six cingular plates, and at least one intercingular boundary on the dorsal surface (Fensome et al. 1993). Characters (from Fensome et al. 1993): Test with four Kofoid apical plates; five postcingular plates; cingulum distinct with four to six cingular plates, excluding transitional plate where present; at least one dorsal intercingular boundary present. Cysts typically cavate, peridinioid; archeopyle may be focussed on dorsal surface or in apical region. [CF03] Cruickshank, A. R. I., & R. E. Fordyce. 2003. A new marine reptile (Sauropterygia) from New Zealand: Further evidence for a Late Cretaceous austral radiation of cryptoclidid plesiosaurs. Palaeontology 45 (3): 557–575.